Caio! Today is our last day in Rome : ( We left Florence on Wednesday morning. We left to early to get breakfast at the hostel (darn--no raw meat and cookies with Guido) so we broke down and had McDonalds at the train station...I know, we are so ashamed of ourselves. When we arrived in Rome we checked into our hostel. It turned out it was just the office, but a nice boy named Pepino carried both our bags to the other building (actually we dont know his name--thats just the name we gave him). After that we headed to the Colosseum, since it is pretty close to our hostel. It wasnt until we arrived there that we both realized we were broke and needed some money. As it turns out there are no ATM machines within a two mile radius of the Colesseum. We got to see a lot of the city before we actually found one. Afterwards we visited the Colesseum and Palantina. It was really cool and we couldnt help but quote Gladiator the whole time. Too bad we didnt see Maximus, but we did see a lot of guys dressed as Gladiators. We also got to see the Roman Forum. It had these really cool white columns outside that turned out to be made of plastic and put there for a fashion show. We saw the Museo Capitoline and Trajans Column. Then had dinner outside at a REAL Itallian restaraunt. Heather had Lasagna and Eden had Spaghetti with Vongole (Clams, sorry mom we couldnt find it on Pizza). We went back to the hostel and slept (when buses werent driving by and shaking the whole room. Our second day in Rome we visited the Vatican. It was so amazing! It was pretty far away so we took the Metro. We were packed into that train like sardines. Lets just say if you ever use the metro in Rome you better hope the people around you are wearing extra strength deodorant...what with all the arm raising going on...to hold on to the poles. We went to St. Peters first. We went through the tomb of the popes. We saw John Paul II tomb. People were kneeling in front of it, kissing it, and crossing themselves. It is a very sacred place to the Catholics. Afterwards we went up to St. Peters Basilica. It was Amazing and huge! We saw michelangelos Pieta (which is beautiful). We stood in a huge line for the Vatican Museum for a few hours(which is where the Sistine Chapel is. It was Internation Tourist day so we got in for free--we are having a streak of good luck. You wouldnt expect it, but you have to go through eleventy billion rooms just to get to the Chapel. Its worth it though. Its so peaceful (except for the part where you walk through the door and the guard is yelling "No Photo!!") We had to strain our necks just to look at it so we have no idea how Michelangelo maintained that position for YEARS just to paint it. We also hit the Trevi fountain and threw our coins in. You throw two coins in. 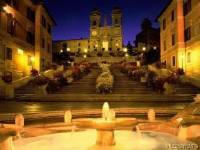 One means you will return to Rome someday and the other ensures that you will fall in love during your visit. We want a refund! Its our last night in Rome and we havent fallen in love yet! It started raining buckets so we went home. We were surprised to find we had a new roommate...and he was a MAN! They messed up with the reservations and had no where else to put him. Oh dear! He was very friendly...almost as friendly as Guido. He is from El Salvador, but works in Morocco. We are starting to notice a strange trend. The other girls in our room were not to happy. Actually, they all checked out the next morning. Day Three! We started off on foot in search of the Pantheon. On our way (which wasnt really on the way--we just got lost) we found the mouth of truth. Heather lied and it bit her hand off. Haha. J\K We found the Pantheon and it started pouring again. We made it inside and saw the water coming down through the hole in the dome. Then we went to Piaza Nivona and the Spanish steps. Eden also dragged Heather into Zara, a clothing store. You would all be proud to know that she exercised her self control and didnt even try anything on! We grabbed some groceries for lunch and went back to our hostel to eat. We ran into Eric of El Salvador who wanted to go to a disco with us. It turns out he was very intuitive, sensed our discofort, and had them move him to a different room. That was after he got our picture and email addresses...now we have the room all to ourselves!!! What a relief--no more coed sleepovers. Then we went to San Clemente. A beautiful and uncrowded church. Now here we are at an internet cafe. We better go! We are headed to venice tomorrow.